Another month – another great project by Creatively Caring: Jared Boxes. It is amazing how these people come up with ideas and ways to help local causes. I honestly love when help by a community goes back into the community and you can see happy faces of people touched by the project and attention. A year ago first grader Bryan was attending a summer day camp, where he was accidentally kicked while swimming and experienced stomach pains and vomiting. At first,they thought his appendix had burst, but doctors said a tumor on his kidney the size of an orange had ruptured. He was air-lifted to the University of Chicago Hospital and diagnosed with Stage 3 kidney cancer. Over the course of six months, Ryan underwent numerous treatments, but he only missed about 18 days of school. 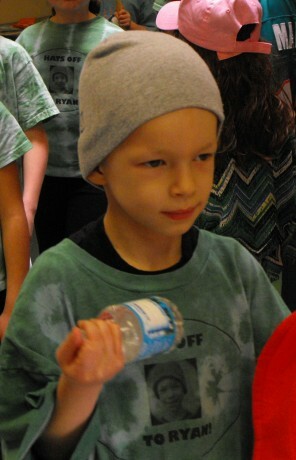 In February, Ryan and his family found out that his disease was finally in remission. Creatively Caring organized Jared Boxes project for the kids at Comer Children’s Hospital where Ryan has been undergoing his treatment. This event received an amazing support from the community members – families from the surrounding towns brought different items for the shoe boxes and kids got to fill and decorate the boxes. The goal of the Jared Box Project (called after a brave little boy, who lost his life to cancer in 2000 at the age of 5) is to lift the spirits of chronically ill children. The boxes symbolize the importance of play and are filled with well wishes, hope, and love. 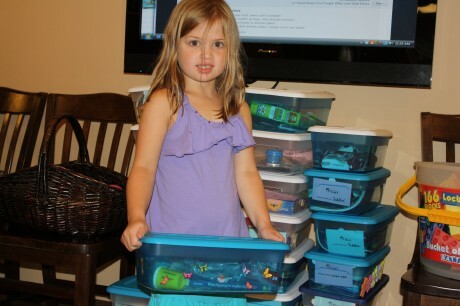 A Jared Box is a shoebox size plastic storage box filled with small gifts, toys, cards, and games. 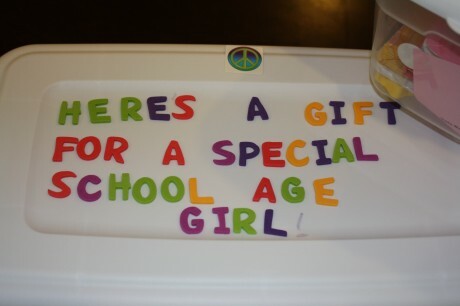 Each box contains items selected for a specific age and gender. 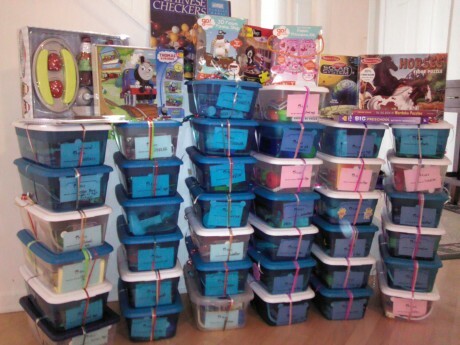 The boxes are delivered to hospitals and are given to chronically ill children. The Jared Boxes provide a special diversion for young patients as they receive chemotherapy and other medical treatments. After all the boxes were assembled, Ryan and his family personally delivered them to the Comer Children’s Hospital. Creatively Caring works with local businesses and non-profit organizations to enrich our community through fun, family service projects. Families with children of all ages are encouraged to participate in our projects which help people, animals and the environment. Nibbles Play Cafe (Wheeling, IL) is a fusion of cafe and kids indoor play place, where adults can relax and young children keep busy in imaginative play! Nibbles has committed to support community and its members. What a wonderful project and a great way to make a difference! I’ve heard about the Jared Box program before- I’d love to see a chapter of this organization opened near me. I always try to donate excess toys and craft supplies to the local hospitals. What a wonderful program to be apart of! What an amazing program. I’m sure it is a delight for the recipients and heartwarming for those putting them together. I never heard about this either! What an absolutely amazing program! That is an amazing project and how lucky for him to be kicked! This is so inspiring! What a wonderful project!